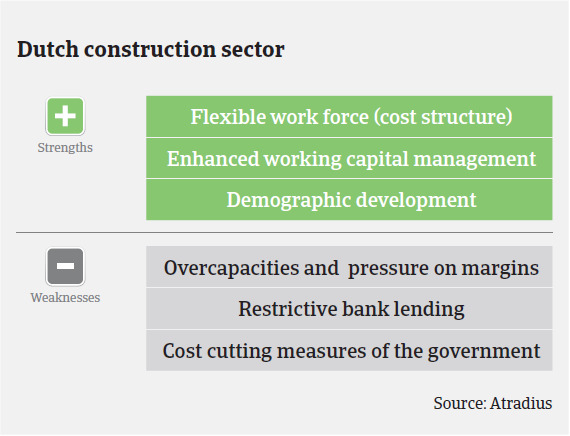 As in 2013 and 2014, fierce competition means that the Dutch construction sector is still affected by price wars, leading to on-going pressure on margins. Despite some positive developments (increased sales of and higher prices for private homes sold and increased building permits in Q4 of 2014) the Dutch construction market remains weak, as demand is still very low compared to the (pre-crisis) period before 2008. Due to continued tight mortgage lending practices and banks´ restrictive loan policies towards construction companies we do not expect a robust rebound in the short-term, despite signs that the deterioration has bottomed out. The immediate outlook for residential and both private and public non-residential construction is less gloomy than in the past. However there is still overcapacity in office buildings. At the same time construction businesses dealing with utility and public works still show no improvement. Businesses active in the utility construction subsector still show decreasing revenues with strong pressure on their margins, while specialised construction companies record stable revenues at least. The persistent low construction volumes and subdued private spending still affect the construction materials segment, and we expect many businesses in this subsector to report negative results for 2014. However, as many companies have anticipated the difficult business circumstances expected in 2014 and 2015 and have reorganised accordingly, they could report better results in 2015. 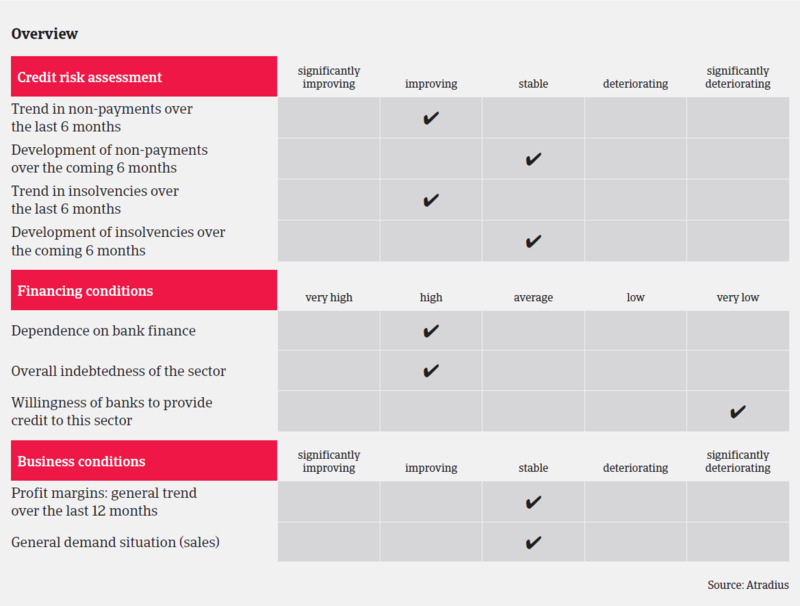 We have seen a deterioration of payment behaviour over the last few years, especially during the significant performance downturn in 2012 and 2013. Due to the adverse economic situation and more restrictive bank lending, payment periods in the sector have increased to an average of 60 days. In 2014 we noticed that some of the larger Dutch construction businesses took advantage of their market position by stretching payments to their suppliers. However, we have recorded a decrease in notifications of non-payments over the past six months and expect payment behaviour to be stable in 2015. As in 2013 and 2014, fierce competition means that the Dutch construction sector is still affected by price wars, leading to on-going pressure on margins. The liquidity of many companies has weakened due to losses and impairments, straining both solvency and liquidity. As a result, businesses´ focus is still on cash flow and working capital - and on tighter credit management. In 2014, 1,062 construction companies became insolvent, a 34% year-on-year decrease after massive increases in previous years. Mainly carpentry companies, electricians, painters and other specialised construction companies recorded decreases. However, despite this decline we noticed that several large (top 10) construction companies had more financial troubles than in 2013. In 2015 we expect construction insolvencies only to level off, in line with the overall Dutch business insolvency development. The GDP growth forecast of 1.3%-1.6% does not seem to be enough for another substantial decrease in insolvencies this year. Despite the fact that many Dutch construction businesses went bankrupt in the last couple of years there is still overcapacity in the market, and a consolidation has yet to take place. When assessing a buyer’s creditworthiness, we require up-to-date financials, and details of the 2015 order book and payment experience. Additionally we seek details on the company’s financing (covenants/securities) and the maturity dates of bank loans. Our aim is still to maximise the insurance cover we can give our customers, and in this respect third party securities, if available, can help. Compared to 2013, our risk acceptance of buyers in the Dutch construction sector already increased in 2014. The rebound of the Dutch economy is expected to accelerate in 2015, with export growth accompanied by a recovery in private consumption, industrial production and investment. Despite the still fragile situation, in 2014 Dutch retail trade has benefited from higher consumer confidence, economic growth and improved purchasing power.